Using these information antenna look angle can be calculated using Napier’s rule (solving spherical triangle). Azimuth angle denotes the horizontal angle measured at the earth station antenna to north pole. 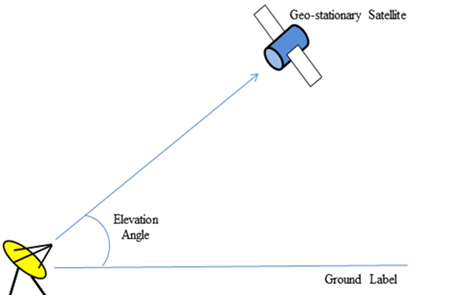 Elevation is such angle denotes the vertical angle measured at the earth station antenna end from ground to satellite position. Here G = Difference between satellite orbital position and earth station antenna. L = Latitude of your earth station antenna. In the above picture Az means azimuth angle required to track the satellite horizontally. In the figure below the elevation angle has been shown. 1) If the satellite orbital location is in east (E), then G = Antenna longitude - Satellite orbital position. Welcome to my site to get new post about this topic. yes brother. We always try to keep update this site. Be always with this site and keep yourself updated. Symbol rate, Bandwidth and Bit rate Calculation for Broadcast Engineering. What is Modulation ? AM, FM and PM.